The 56 passenger charter bus is the largest bus available. Plenty of storage space and ample room to spread out, this bus is ideal for long distance trips with bigger groups of students, employees, wedding guests, and more. Your group will ride in complete comfort with this reliable, safe transportation option. 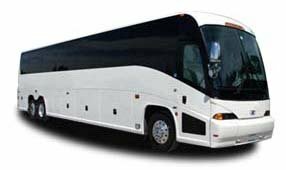 Whether you need one bus or a whole fleet, LA Charter Bus Company is your go-to resource for easy and reliable bus rentals for corporate events, weddings, school events, sports teams, and more. Call us today at 310-667-6197​ to receive your free, no-obligation quote. We’re available 24/7 for your convenience.